However, none of them makes the entire trip. Instead, they lay their eggs and die along the way. 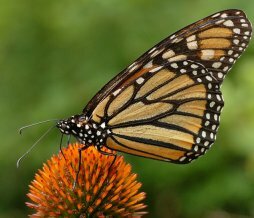 The new monarchs that hatch develop into adults and then continue the journey. These monarchs typically live only about two months in total, at which point they lay their eggs and die. This continues until August, when the members of the current generation, none of which has ever seen the fir forest in Mexico, make the trip back there. Individuals often end up landing on the same tree in which their forefathers spent the winter!2 How do these intrepid travelers know where to go? That matter is still under investigation. It turns out that this migration is just one of the marvels of the monarch. Current research indicates that monarch mothers are also able to medicate their offspring! Monarchs can be infected by a single-celled parasite called Ophryocystis elektroscirrha. If a female caterpillar is infected, her offspring will be infected if she matures, mates, and lays eggs. This infection can kill the offspring, and even if the offspring survive, they will have problems flying and will have a shortened lifespan. What is special about the specific species of milkweed that the infected females preferred? It contains high concentrations of poisonous chemicals called cardenolides. These chemicals are harmless to the caterpillars that hatch from the monarch eggs, but they make the caterpillars toxic to most of their predators, even once the caterpillars have matured into adults. While uninfected monarch mothers did not preferentially lay their eggs on the milkweed species with high levels of cardenolides, infected mothers did. Why? Well, it turns out that the cardenolides help fight the infection of the Ophryocystis elektroscirrha parasite. They don’t necessarily get rid of the infection entirely, but they definitely make it less severe, which means the infected mother’s offspring will be healthier than if the mother had laid her eggs on a species of milkweed without high levels of cardenolides. In other words, the mother somehow knows that her offspring are in danger because of her infection, and she chooses to lay her eggs on a plant that will lessen the danger. What is truly amazing about this result is that the mother gains no benefit from this behavior – only the offspring benefit. Also, since uninfected mothers showed no preference, this is clearly a behavior that has to be triggered by the infection. If the mother is infected, she selects a plant that will combat the infection in her offspring. If the mother is not infected, she doesn’t bother to select a specific plant. There hasn’t been an enormous amount of research into the subject of how and when animals use medicine in an attempt to heal themselves or their offspring. Hopefully, studies like this one will encourage more research on this fascinating topic. I personally think that there are probably many, many examples of this in creation, as the Creator’s ingenuity is truly astounding. We are only beginning to scratch the surface of His incredible works! Do the infected butterflies have any symptoms themselves, or are the only symptoms the birth defects in the offspring? In other words, do they know they are sick? The big question is, “How do they know? and I suppose the only logical answer is that God personally directs each individual butterfly where to lay her eggs. What a lesson for us. If I was a monarch, and God told me to lay my eggs on a milkweed I would say something like, “Oh, ok, lets see.. Here’s a nice milkweed. Oh, but look at that rose! It’s right next to the milkweed, and its so much prettier. I’ll lay my eggs there. God won’t mind. He sees that I had good intentions, and the rose is so near, its ALMOST like I did exactly what He said. That’s a lot closer than most people get to obeying. And my children would all have deformed wings. Debbie, in answer to your question, the infected butterflies do have symptoms. They have difficulty flying, for example. We have no idea whether or not they actually know they are sick, of course, but by observing the differences between them and healthy butterflies, we can tell they are sick. Your analogy is awesome and contains a LOT of truth. However, I don’t think the idea that “God personally directs each individual butterfly” is correct. Rather than personally directing them, I think He indirectly directs them by virtue of how he designed life. He designed life to be more complex than we can possibly comprehend at this time. That complex design probably involves the ability to develop instincts that will help organisms fight the problems that have appeared in a fallen world. This is so cool! I don’t have another word to describe it (except for ‘awesome’ and the bunches of other synonyms for generally amazing). God is great. God is, indeed, great, Miranda. Unfortunately, a lot of chemistry books oversimplify things. I am glad that you appreciate the true definition!